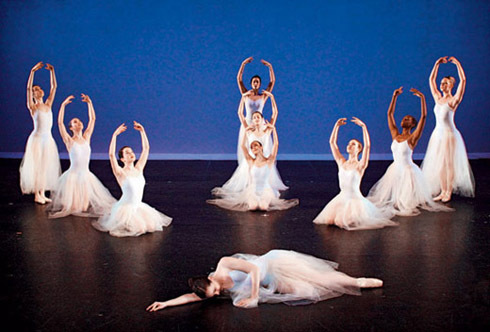 Ballerina Heather Watts coached these Harvard Dance Center students in this performance of George Balanchine’s Serenade. Her presence on campus is a sign of a burgeoning of interest in dance at Harvard and a flowering of commitment by the University administration. Watts may not have attended college herself—a Ford Foundation scholarship at the age of 13 took her to New York to study with Balanchine, and she spent 24 years dancing with his company—but her firsthand knowledge gives Harvard undergraduates and graduate students a privileged look at the works and personality of one of the great artists of the twentieth century. “What we offer here is a blend of the experiential, the historical, and the theoretical,” says Elizabeth Bergmann, the energetic dance administrator who has led the Harvard Dance Program since 2000. A dance community that was often overlooked by the University as a whole now boasts extracurricular student troupes specializing in everything from Bhangra to ballroom, for-credit courses taught by dance professionals, and the glamorous, efficient space of the new Harvard Dance Center, which lies along the gentle swell of Observatory Hill on Garden Street and is busy from midday to midnight. “There are 700 students using the building every week, and that’s not including audiences,” Bergmann explains. Dancing at Harvard can be a huge time commitment: some students rehearse and take classes up to 30 hours a week in addition to managing a full course load. It’s not uncommon to see a dancer stretching in the corner with a laptop open in front of her. Though dance at Harvard may have a new visibility, it boasts a long tradition. Art connoisseur Lincoln Kirstein ’30 founded, with Balanchine, what would become the School of American Ballet and NYCB. Beginning in 1965, modern dancer Claire Mallardi ran the undergraduate dance program, expanding it to incorporate a broad variety of genres. As artistic director emerita she continues to teach “Movement for Actors,” a course she introduced in the mid 1980s. Students rallied. “They developed a 50-page report with all kinds of statistics, press clippings, and letters from alums,” McCormick remembers, “signed by a mix of people who had gone into the arts and others who were management consultants, software developers, policy people with the World Health Organization—all advocating for dance at Harvard.” A planning committee led by associate dean of Harvard College Judith Kidd worked quickly. In September 2005, Harvard cut the ribbon on a new $4.5-million facility, designed by Bruner, Cott & Associates, a stand-alone structure that sits inside one-half of the existing multipurpose Quadrangle Recreational Athletic Center (see “Big Step,” January-Feburary 2006, page 70). Personal connection with dance professionals has made all the difference for some Harvard students. Kate Ahlborn ’07 took the initiative to cold-contact Damian Woetzel, an NYCB star (after trying seven likely permutations of his e-mail address). Ahlborn had “heard through the grapevine” that Woetzel was earning his master’s in public administration at the Kennedy School of Government with an eye toward preparing for a future career in arts policy or international affairs after his dancing days were done. Would he be willing to teach a class occasionally for the Harvard Ballet Company? Woetzel wrote back to say that he was settling into student life, but that perhaps his wife, former NYCB principal dancer Heather Watts, would be available. On a Sunday night a few weeks later, Watts taught a ballet-technique class. Ultimately Elizabeth Bergmann convinced her to teach both technique and the Balanchine seminar. When, with the approval of the Balanchine Trust, Watts set excerpts from Balanchine’s Apollo on the students, Woetzel was on hand to coach Adam Singerman ’09 in the title role. A handful of dancers carry their Harvard degrees into professional dance careers. Elizabeth Waterhouse ’02, a former physics concentrator, now dances with the Forsythe Company in Dresden, Germany. Marie “Molly” Altenburg ’07, a winner of Harvard’s Suzanne Farrell Dance Prize, who danced with the Washington Ballet before enrolling at Harvard, expects to audition for ballet companies after she graduates. For many more, dancing will be a compelling avocation for the next decade or beyond. Boston dance critic Debra Cash earned a master’s degree in design studies from the Graduate School of Design in 1995. A former scholar-in-residence at Jacob’s Pillow, she teaches dance history at Emerson College.